is a historian and independent scholar. Her research focuses on race and class in US history. Her first book, Masterless Men: Poor Whites, Slavery, and Capitalism in the Deep South, will be published by Cambridge University Press next year. Shortly after emancipation in 1865, African Americans began fighting for the rights to the lands they had long worked – cultivated by their hands, fed by their sweat, and stained by their blood. Yet while the government stifled freedmen’s demands for ‘40 acres and a mule’ as just compensation for generations of unpaid, brutalised slave labour, they simultaneously granted free land to whites. Indeed, when the failure of land distribution among blacks during the Reconstruction is judged within the context of the Homestead Acts, the reality of the situation is laid bare. The problem was never the radical nature of land reform. The problem was racism. When judged comparatively with other nations’ emancipatory histories, the Reconstruction experience in the United States is unique. While African Americans were the only freed slaves to be granted political rights so soon after emancipation, those rights were limited for a people without capital or job prospects. Land would have served as the primary source for reparations. President Abraham Lincoln signed the original Homestead Act into law during the second year of the Civil War. Between 1868 and 1934, it granted 246 million acres of western land – an area close to the land mass of both California and Texas – to individual Americans, virtually for free. To receive 160 acres of government land, claimants had to complete a three-part process: first, file an application. Second, improve the land for five years. Third, file for the deed of ownership. Because of the date of the Act’s passage, few people from the South initially received any benefit from it. Yet given that it effectively remained in place until 1934, well over 1.5 million white families – both American-born and immigrant – eventually profited from it. And, although the process was rife with fraud, as many homesteaders sold their plots to corporations, the original claimants pocketed the income from land sales, establishing a basis of wealth and capital. By the end of the Act, more than 270 million acres of western land had been transferred to individuals, almost all of whom were white. Nearly 10 per cent of all the land in the entire US was given to homesteaders for little more than a filing fee. Enacted in 1866 shortly after the end of the Civil War, the Southern Homestead Act (SHA) was supposed to function much like the original Act. During the first year of the SHA, unoccupied southern land was offered exclusively to African Americans and loyal whites, but after 1867 even landless former Confederates applied. Although the SHA ostensibly offered a solution to several pressing Reconstruction-era issues, in reality, a large percentage of the land offered was un-farmable, being either heavily wooded or covered with swamps. Furthermore, it was hard to administratively arrange homesteading, as many southern states had only one land office. Depending on where the office was located, it could take several weeks to simply make the trip, meaning the bureaucratic duties cost far more than the filing fees for the actual land. Furthermore, the recently emancipated owned no cash and had no experience in dealing with the government, rendering the process even more difficult. But perhaps the biggest hurdle for freedpeople involved the year-long labour contracts they had been cajoled or forced into signing shortly after slavery was outlawed. Leaving a job before the end date of a contract frequently resulted in virtual re-enslavement on a chain gang. Indeed, blacks had been locked into these contracts until the very date (1 January 1867) that they stopped receiving special homesteading benefits. By the end of the SHA 10 years later, nearly 28,000 individuals had been awarded land. Combined with the claimants of the original Homestead Act, then, more than 1.6 million white families – both native-born and immigrant – succeeded in becoming landowners during the next several decades. Conversely, only 4,000 to 5,500 African-American claimants ever received final land patents from the SHA. The Homestead Acts were unquestionably the most extensive, radical, redistributive governmental policy in US history. The number of adult descendants of the original Homestead Act recipients living in the year 2000 was estimated to be around 46 million people, about a quarter of the US adult population. If that many white Americans can trace their legacy of wealth and property ownership to a single entitlement programme, then the perpetuation of black poverty must also be linked to national policy. 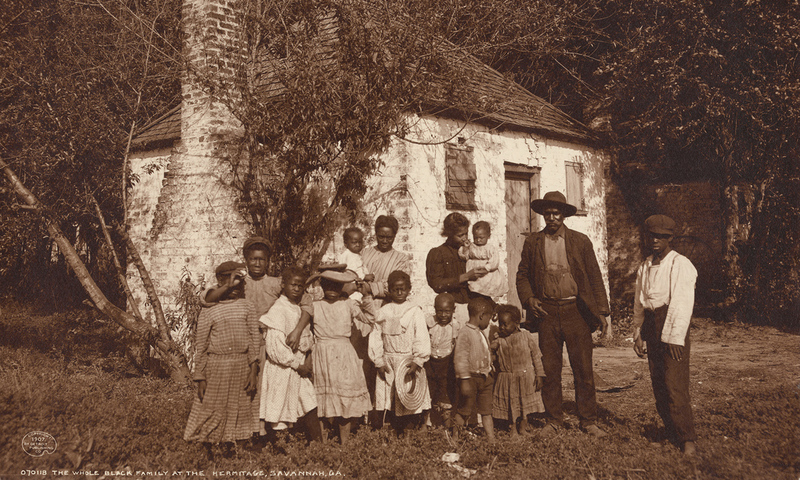 Indeed, the Homestead Acts excluded African Americans not in letter, but in practice – a template that the government would propagate for the next century and a half. With the advent of emancipation, therefore, blacks became the only race in the US ever to start out, as an entire people, with close to zero capital. Having nothing else upon which to build or generate wealth, the majority of freedmen had little real chance of breaking the cycles of poverty created by slavery, and perpetuated by federal policy. The stain of slavery, it seems, is much more widespread and lasting than many Americans have admitted. Yet it is the legacy of the Reconstruction – particularly the failure of land redistribution – that so closely coupled poverty and race in the US.